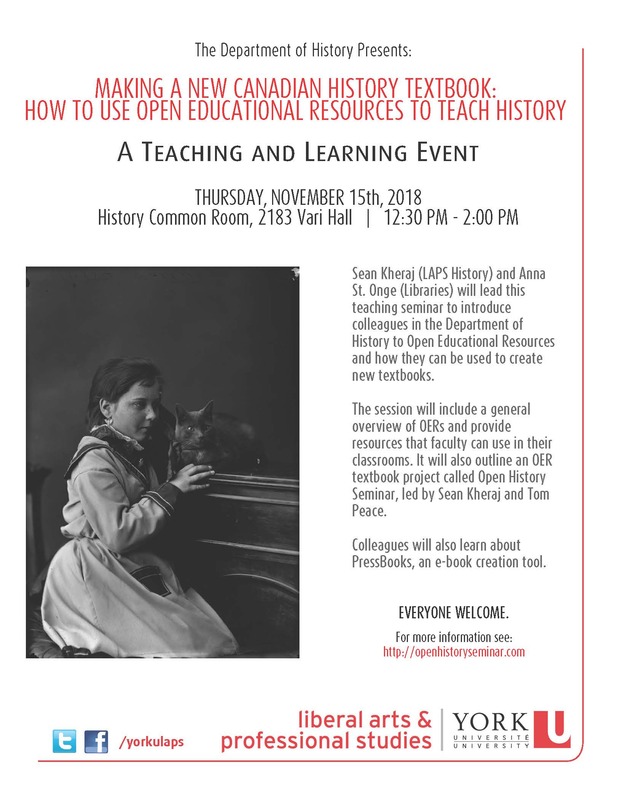 On Thursday, November 15, 2018, the Department of History at York University held a teaching and learning event titled, “Making a New Canadian History Textbook: How to Use Open Educational Resources to Teach History.” I gave a short presentation about my work with Tom Peace and eCampus Ontario to produce a new open textbook for undergraduate Canadian history courses called, Open History Seminar: Canadian History. Belshaw, John Douglas. Canadian History: Pre-Confederation. Vancouver: BC Open Textbook Project, 2015. Belshaw, John Douglas. Canadian History: Post-Confederation. Vancouver: BC Open Textbook Project, 2016. Sean Kheraj, “What is Open? History and Open Education Resources” ActiveHistory.ca, 16 August 2018. ← Why do we still print the course syllabus?